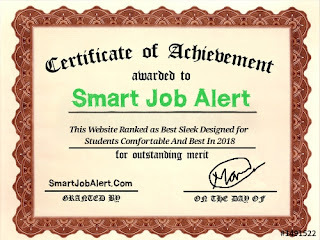 This website providing latest job related notifications government jobs , railway jobs, computer , banking for getting notification of a job keep in touch with Smart Job Alert and get a subscription notification through your email. Smart job alert getting a certificate form many Educational Board University helping the students with proper information regarding jobs. We update daily notification related Indian Army, Indian government jobs, Indian Navy, jobs and much more. Smart job alert is managed by a Team. There are more than many social messaging services we are providing to update the candidates with daily jobs notifications. Smart job alert also support customer chat plugin for instant help regarding jobs. 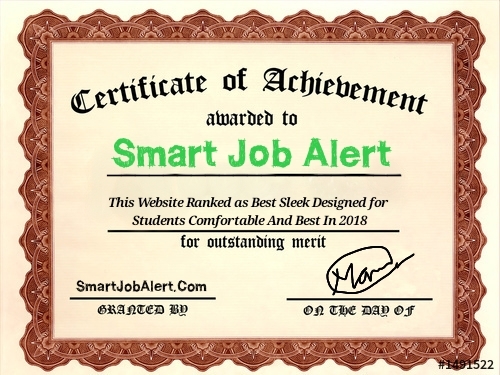 Smart Job Alert is launched in 2014 from this year we are starting providing latest government jobs notification to the candidates for the opportunity. As simple as we provide best designed website for students this is a simple portal website. In 2016 this website closed for 1 year because due to no good response later in 2017 smart job alert start beginning the journey. Then we promise to every students providing as best as simple design for students comfortable. Our main aim is to provide every job notification in sleek and simple design and best information for students. We are also having many social messaging by which we providing notifications. If you have any question only recommendation for improvement This website Please Visit our contact us Section. We will moving forward on it. Our main goal is to provide best and simple design for students comfortable with proper information. We are completing all States Jobs notification in Smart Job Alert. We need your valuable feedback. Thank you for stay here !